Tennis Programming For Ages 11 To 12. Green Court: (Ages 11 to 12) CHHRC’s Green Court program is structured to refine our children’s strokes as well as rally development. By the end of the season our aim is to have the children understand the rules of tennis, how to keep score and compete in a match. Proper grips, footwork and spin will be emphasized in this program. Green – Tournament Training: (Ages 11 to 12) CHHRC’s Green Tournament Training program is the next level up from Green Court. These players will continue to work on shot selection and rally development. In order to participate in this program you must be able to hold a consistent rally and have a consistent serve. You should be competing in match play as well as understand the rules to the game. Our pros will go over the technical and tactical aspects to developing your child into a tournament player. Children will learn the benefits of different spin and proper footwork. Tennis Programming For Ages 13 To 18. Developmental: (Ages 13 & Up) Our Developmental program is an introductory into the sport of a lifetime. Our pros will breakdown each stroke to help the children better understand the technique and contact to be able to sustain a rally. The children will progress into rally development and aim to be able to play points by the end of the season. Challengers: (Ages 13 & Up) CHHRC’s Challengers program is for our intermediate players that can sustain a rally and are looking to refine some of their skills. This program will focus on footwork, grip and point development. Player’s will learn both the offensive and defensive side to a tennis match. In order to participate in this program you must understand the rules of tennis, how to keep score and should be playing matches. Tournament Training: (Ages 13 & Up) This program is for advanced players only. You must be competing or ready to compete in tournament/match play. CHHRC’s aim is to develop your child into a well-rounded tennis player by implementing different spin, depth and shot selection. Your child will learn how to take the offense, play defensive as well as exploit the opponent’s weakness. Match Play For Ages 11 To 18. High School: (Ages 14 to 18) This program is for our high school tennis players. Children will refine their skills during their off-season to make sure they are ready to compete. Singles and doubles strategy will be emphasized as well as proper footwork and grip. We will also be offering a drop in clinic for the children to train twice a week before their season begins. Private tennis lessons are available for all players, both members and nonmembers. Private tennis lessons are personally arranged with the tennis pro of your choice. 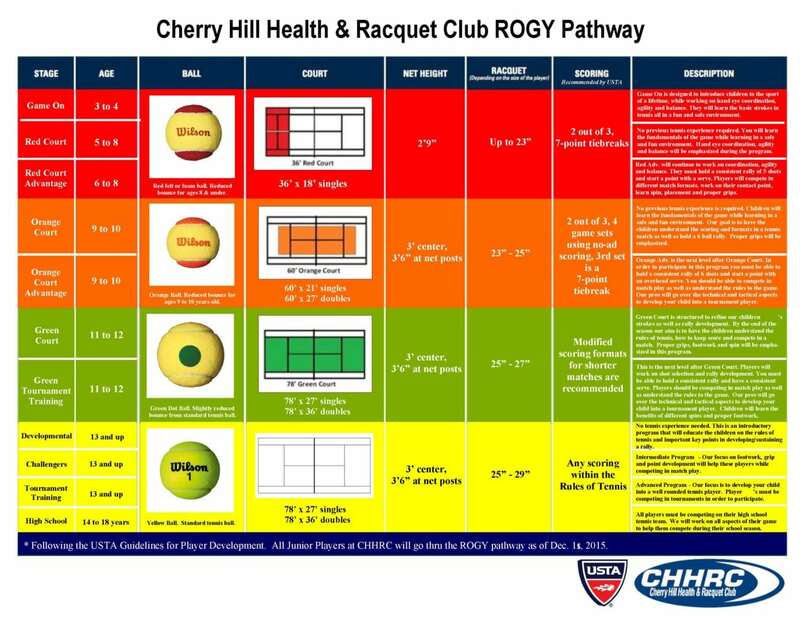 To schedule a tennis lesson, please call Rick Hoffmann at 856.429.1388 x166 or email rhoffmann@chhrc.com.